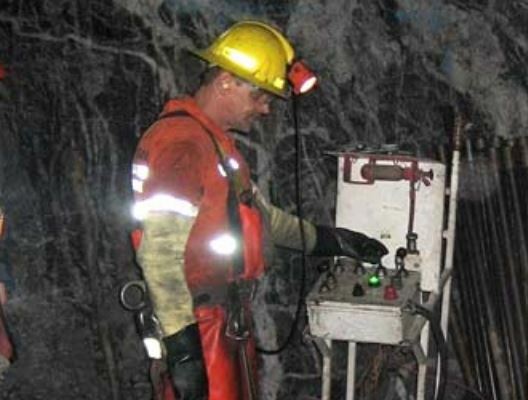 An underground driller at work at the now closed Max molybdenum mine near Trout Lake, British Columbia. Note the veins of massive molybdenite. Photo Courtesy Roca Mines Inc.
Cameo Cobalt Corp. [CRU-TSX; CRUUF-OTC; SY7N-FWB] shares were active Thursday March 7after the company said it had closed the previously announced acquisition of the Max Mine and Willa properties. Both are located in British Columbia. Cameo shares advanced on the news, rising 3.85% or $0.05 to 13.5 cents on volume of 2.53 million. The shares trade in a 52-week range of 5 cents and 45 cents. Cameo said it has received final TSX Venture Exchange approval for the purchase of the mining assets in an arms-length transaction from MX Gold Corp. [MXL-TSXV; MXLGF-OTC; 0DV-FSE] for a combination of cash and common shares of the company and the granting of a 50% net profits interest in the two mining properties going forward. Under an agreement, Cameo pledged to pay $578,982 to the vendor, consisting of $53,982 to renew certain mineral claims, plus $150,000 in cash and issue 5.0 million shares at $0.075 per share. “The acquisition of the past-producing MAX molybdenum mine and mill, as well as the Willa property, are watershed purchases for Cameo,” said Cameo CEO Akash Patel. “The company now holds claim to a turnkey mine and mill complex, which will act as a material catalyst for corporate development and growth,” he said. Patel was previously an officer and director of MX Gold Corp. After he resigned from those positions in January 2018, he provided transitional consulting services to MX Gold in relation to its financial reporting. The MAX property covers more than 5,200 hectares near the community of Trout Lake in southeastern B.C. It includes a mill and the underground workings of the MAX molybdenum project. Commercial production began in 2008, but was suspended in September 2010 due to the collapse of an underground pillar. During a Resource World tour of the Max moly mine when it was in production, large spectacular zones of massive molybdenite were observed in the underground workings. It has been suggested that the MAX molybdenum project mill could be used to process gold-copper-silver mineralized material from the Willa deposit. The MAX mill is located 142 km from the Willa deposit by road. According to a historical estimate, the Willa property is thought to host 134,000 ounces of gold, 15.5 million pounds of copper and 244,000 ounces of silver in the combined measured and indicated categories. Cameo said the estimate is based on 56,312 metres of drilling in 593 holes that were drilled between 1965 and 2004. The vast majority of the drilling was conducted underground. A 2016 technical study has recommended the extraction of a 10,000 tonne bulk sample to confirm existing metallurgical tests. Cameo said it plans to evaluate the relevance and reliability of the historical estimate and what steps must be taken to verity the key assumptions, parameters and methods used to characterize the Willa deposit. The underground Willa deposit is located on a 5,600-hectare claim block and is accessible from B.C. Highway 6, approximately 160 km south of Revelstoke, B.C. and 7.5 km south of the small town of Silverton, above Slocan Lake.